Eh may point naman. Stressed ka na nga sa work, gutom ka pa?! No way! So they decided to give Carmen’s Best Ice Cream a try. Haven’t heard of it actually but they say it’s kinda gaining it’s popularity because apparently, it’s very yummy. So even though it’s kinda expensive, they still got 2 flavors and tried it out. 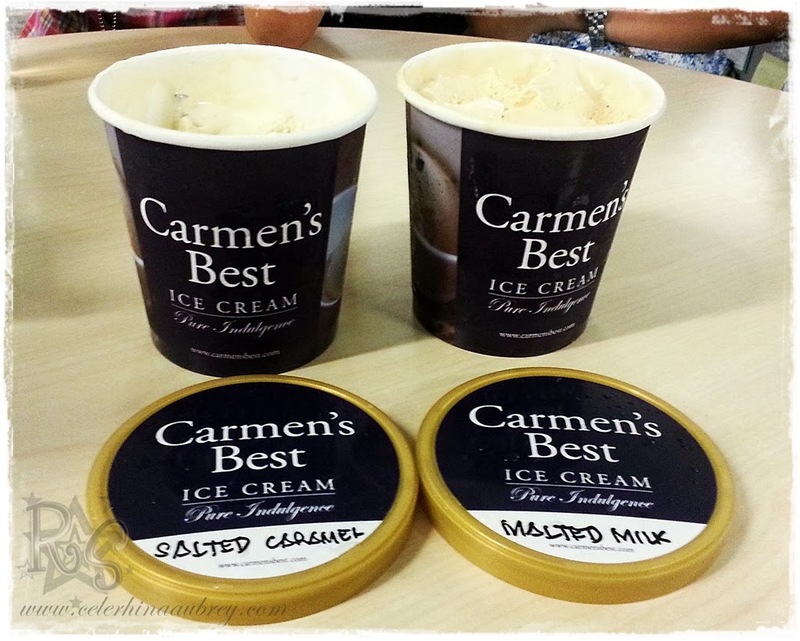 So when they say it’s Carmen’s best ice cream, they really mean it’s the BEST! Ang sarap!!! I checked their website and they say it’s because their ice cream are made of fresh milk from their own farm and have searched the world for the best ingredients. The ice cream are so creamy. I am a big fan of Salted Caramel and Carmen’s Salted Caramel is the bomb! It’s one of their best sellers actually. It’s not too sweet and nakakaumay. Super sarap. I could finish the entire tub in one sitting. That’s how yummy it is. Malted Milk on the other hand is extra creamy and “milky” with Maltesers chocolate. I actually am not a big fan of maltesers because I find it too sweet. But the creaminess of the ice cream balances out the sweetness. And although I love anything Salted Caramel, I can’t decide which among the two flavors I love more. Ganun sya kasarap! I can’t wait to the try the other flavors!!! Kaso since I’m still pregnant, I think I have to wait until it’s safe to actually finish those 2 tubs in one go! Medyo mahirap lang syang hanapin but their store is at Valero St, Makati.